A Disney version of the 2018 Honda Odyssey is on display at the LA Auto Show through December 10, 2017. The LA Auto Show has arrived with several new attractions and activations across the Los Angeles Convention Center’s indoor and outdoor areas. Families can enjoy simulators, test drives, one-of-a-kind rides and of course, some of the newest and coolest vehicles and mobility innovations. Among the displays taking place during the LA Auto Show, there are a variety of options for families with children, including the Xbox Gaming Lounge, where people can play Forza Motorsport 7 while competing for the chance to win several prizes, and the MINNIE VAN presented by Honda Odyssey. The MINNIE VAN is a one-of-a-kind display vehicle, inspired by Minnie Mouse, that debuted this past July at Disney’s fan event D23 Expo. Guests of the show will also be able to experience the Ford GT as part of the Microsoft HoloLens Mixed Reality presented by the Petersen Automotive Museum. Daniel Nelson's 1952 Henry J Drag Car will be on display at the LA Auto show through December 10, 2017. Galpin’s Hall of Customs: This year, Galpin’s Hall of Customs will feature a variety of custom vehicles, including its Ford Competition GT, one of only three in the world. It will also host the first public showing of the Aston Martin Vantage until Tuesday, Dec. 5, and will display six other Aston Martins, including the DB11 Volante. Automotive influencer and YouTube sensation Salomondrin will also debut his fuchsia Porsche Carrera GT. Mercedes-AMG Project ONE: For the first time in the US, the two-seater Mercedes-AMG Project ONE will be on public display at the LA Auto Show. This vehicle transfers the latest and most efficient Formula 1 hybrid technology almost one to one from the track to the street for the first time. The performance hybrid produces over 1,000 horsepower at a maximum speed of over 350 km/h. The Mercedes-AMG Project ONE combines stunning racetrack performance and practical Formula 1 hybrid technology with exemplary efficiency. The MINNIE VAN presented by Honda Odyssey: The MINNIE VAN is a unique collaboration between Honda and Disney to create a one-of-a-kind minivan inspired by Minnie Mouse that everyone in the family will love to see. 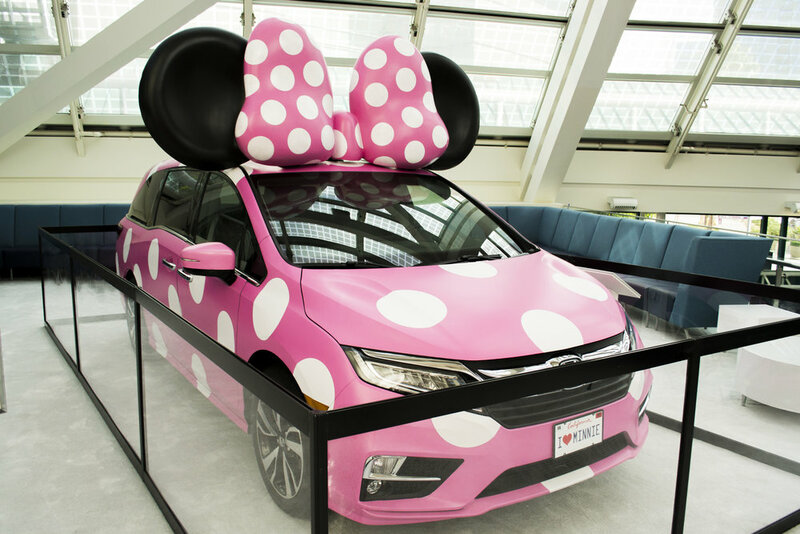 For this display, one all-new 2018 Honda Odyssey was transformed through a pink-polka dot design inspired by Minnie’s iconic style, including her oversized bow and highly recognizable ears perched atop the vehicle. The MINNIE VAN is for display only and will not be for sale. Genesis Open Golf Experience: Located in the South Hall Atrium, the Genesis Open Golf Experience leverages realistic golf simulator technology to create an overall tour event atmosphere, letting players compete in a “Closest to the Pin” contest. Golf simulator participants will be competing for a daily prize of two VIP tickets to attend the Genesis Open in Los Angeles, February 12-18, 2018. The prize tickets include VIP access to the Bluffs and an all-inclusive hospitality experience in a lively atmosphere on the popular PAR-3 14th hole. #HyundaiRacingChallenge: Taking place in the South Hall Atrium, this activation features three unique Hyundai Forza 7 Game Sleds and the Hyundai Veloster. The gaming experience will create a tournament atmosphere where players are encouraged to compete in preliminary rounds for the best lap. Two tournaments will be held daily throughout the run of the show. Players (18+) who achieve the best lap times in the preliminary rounds will be seeded against each other for a chance to win an Xbox and other prizes. Mercedes Benz Iron Schöckl: Guests will have the opportunity to visit the Mercedes-Benz Iron Schöckl and witness the extreme handling and all-terrain capabilities of the G550. This unique experience puts visitors in Mercedes-Benz’s iconic vehicle while scaling grades of 45 degrees. Xbox – Forza Motorsport 7: In the Xbox Gaming Lounge (located in the Concourse Foyer in the Los Angeles Convention Center), attendees can play Forza Motorsport 7 on the all-new Xbox One X and experience the thrill of motorsport with the most comprehensive, beautiful and authentic racing game ever made. Enjoy gorgeous graphics at 60fps and native 4K resolution in HDR, and compete for a chance to win a copy of the game, an Xbox One S bundle, and more. Tickets for the LA Auto Show can be purchased here. The LA Auto Show will be open daily to the public through December 10.